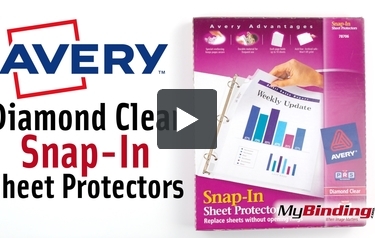 Replacing the pages in your three-ring binder is easy with these Avery Diamond Clear Snap-In Sheet Protectors. The binding edge features a unique design that allows you to slip sheet protectors in and out of your binder without opening the rings, while anchoring the page firmly in the binder until you remove it. Durable material is sturdy enough to withstand frequent use but thin enough to let you view your papers with Avery diamond clarity. The acid-free and archival-safe material keeps your papers in top condition and won't lift print onto the plastic. These sheet protectors are easy to use, but also made of outstanding quality materials. They hold the sheet in place for protection but take just a moment to use them. Any school binder MUST have these protectors in them. I have uses 78706: 50 packet and 75540 10 pack, sheet protectors for several years. What I like most about them, various purpose uses for protecting document. Easy to use with any binders, folders, etc. Easy to re-organize art and craft, business meeting, training and events. Using colors paper making document look great. You can write on them and wipe of information using rubbing alcohol; baby/hand wipes; or hand cleaner . Copy old document and replace them.